Pey-Chwen Lin was born in Taiwan in 1959. She received her doctorate degree of Creative Arts from University of Wollongong in Australia in 1995. She currently is the art professor and director of Digital Art Lab in National Taiwan University of Arts. 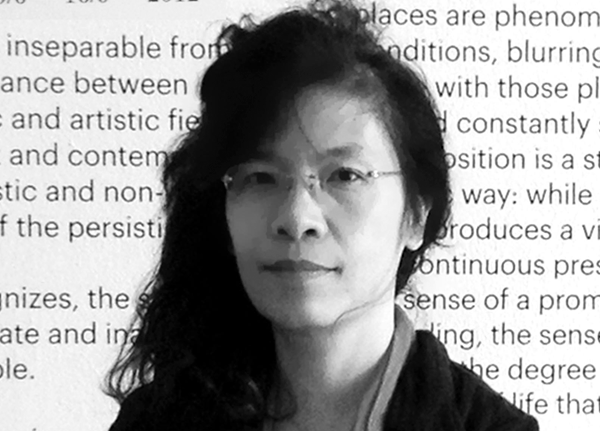 Her artworks are presented in many museums and awarded by many festivals such as National Taiwan Museum of Fine Arts, Taipei Fine Arts Museum, MOCA Taipei, Kaohsiung Museum of Arts, Queens Museum of Art in USA, Lviv National Art Museum in Ukraine and Art Stage Singapore, Taipei Digital Art Festival, 404 Art Festival in Italy and Argentina, Shanghai Electronic Art Festival, Exit and VIA Art Festival in France, WRO Media Art Biennale in Poland, The Tetramatyka Audio Visual Art Festival in Ukraine, Taipei Biennial, Taiwan Biennial and etc., Pey-Chwen’s achievements were recorded in several art books including History of Contemporary Taiwan Woman Artists, Installation Art in Taiwan, Taiwan Contemporary Art, Taiwan Modern Art Series, The History and Development of Digital Art, Art of Taiwan, Digital Aesthetics, Art Island – An Archive of Taiwan Contemporary Artists, High School Art Textbook, Taiwan Digital Art E Files, Yearbook of Chinese Contemporary Art in China, Asian Who’s Who in Singapore and paradoxa feminist art journal in England. The Portrait of Eve Clone Series II is inspired by the beast’s mark in Revelation in Bible, which prophesies that every race,people and nation sealed the beast’s mark 666 on forehead or right hand cannot escape the beast’s control.Lin Pey Chwen criticizes that human want to be the Creator and use genetic technology to create unnatural artificial life.2011 August 12 to September 2, in Lin Pey Chwen’s solo exhibition in Gallery Grand Siècle, there will exhibit four series works: The Portrait of Eve Clone, Mass Production of Eve Clone, Eve Cone No.4 and The inspection of Eve Clone. This work is influenced by the story of Adam and Eve in the Garden of Eden, and their subsequent temptation to eat of the forbidden fruit. The series of The Portrait of Eve Clone is created to present the introspection of an overly developed civilization, which I see as a result of Man’s fall from grace. In The Portrait of Eve Clone, Eve is portrayed as a combination of ‘human and pupa’ or even ‘human and beast.’ Although her beautiful appearance still exists (suggesting that although genetic modification benefits humankind, it may also result in disaster for various species). Eve’s face looks as lifelessly cold as the metallic images of gold, silver, copper, iron, kaolin, etc. Furthermore, on Eve’s forehead, many characters of ‘666’ are in different human languages, including Chinese, Japanese, German, Arabic, Hungarian, Egyptian, etc. The numbers represent obstacles from which all races and peoples cannot escape. In order to present the image of the Eve Clone, I chose to use the high-tech materials of a 3D Hologram. I aimed to show various postures and eye expressions from every direction. In my work, Eve is sealed within transparent acrylic frames, and viewers can also find an image of the beast from Revelation, when moving in front of the work. With the changes of light and the audience’s viewing angles, Eve’s eyes seem to move and follow the viewers.